Brexit: Has started! The fallout and the impact of triggering article 50, what next? 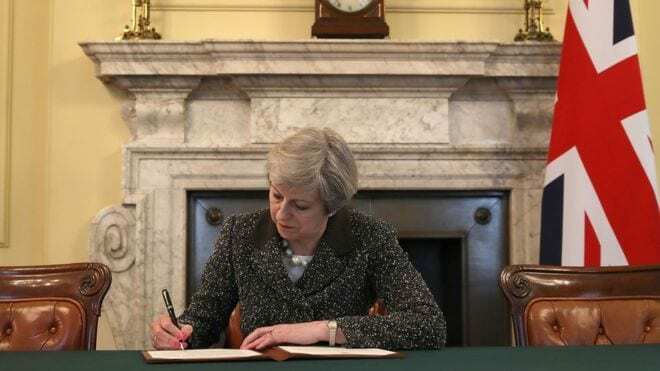 The PM has signed and sent the letter that will trigger article 50, a whole lot has happened and a lot more is going to happen in the next few days. Nicola Sturgeon had a private meeting with the PM, and the speculation is, she has taken some assurances about Scotlands future. We know another referendum is potentially on the books, as well ensuring Scotland has as many options to decide on it’s own future. The Government has to negotiate how a £50bn debt needs to be paid. Technically it needs to be resolved before negotiations on Brexit begin. Brussels has already begun turning the screws on this point. As well as this the U.K. is not allowed to negotiate new trade deals with Non-EU countries, however, somehow it must start planting some seeds, in order to strengthen the value of Sterling and the economy, a job Boris the bullet dodger needs to advance rather than hamper. Can the EU allow the UK to leave without a setting a strong enough precedent to prevent other nations following suit? Logically, Brussels must ensure the deterrence is strong enough, whilst ensuring that it can still have ties with the economic powerhouse that is London. Although some organisations, mainly city firms, have started jumping ship, it is unlikely that the world markets could ignore the importance and significance of London. London and thus the U.K. provide financial expertise to the world as well as being one of the largest investment cities worldwide and the importance of that cannot be ignored. Within Europe, you have Frankfurt as the only real alternative to London, yet it still wouldn’t be the same powerhouse that London is. Arguments can be made for other cities and some potential development is taking places like Luxembourg to accommodate the fallout, but even if they built their own versions of Canary Wharf, it would lack the appeal of London. Logically, they are a group of countries and there is only one of the UK and the key to negotiating positive terms for the UK will ultimately depend on the strength and resolve of the PM and her negotiating team. Perhaps, this is a time to follow in the footsteps of Margret Thatcher.